Postcard showing the Tremont Hotel, formerly located at 145 Main Street (present-day South Magnolia Avenue) in Downtown Orlando, Florida. The hotel was constructed between 1882 and 1895. The original owner was Captain James Walle Wilmott, who reportedly sailed around the world a total of eight times. The site was a conglomeration of three buildings: half of the Charleston House Hotel (the western section with a flat roof), all of the 1875 Orange County Courthouse (the three-story south section), and part of a building that had belonged to the Methodist Church (northern section). The 1872 Union Free Church was also moved to the site to be used as kitchen/outbuilding. The hotel was demolished in 1956. Berger, Molly W. Hotel Dreams: Luxury, Technology, and Urban Ambition in America, 1829-1929. Baltimore: Johns Hopkins University Press, 2011. Genuine Curteich-Chicago. 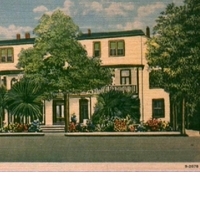 “Tremont Hotel Postcard.” RICHES of Central Florida accessed April 19, 2019, https://richesmi.cah.ucf.edu/omeka/items/show/1371.